Eggnog is the perfect dessert for the holidays. 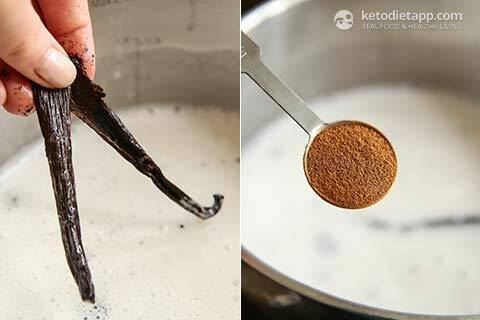 I&apos;ve noticed several requests for a keto-friendly eggnog in the KetoDiet support group, so I spent a couple of weekends making one for my blog. My first attempt ended up being more like eggnog custard. It was still delicious but too thick for ice-cream. After some fine-tuning and using less egg yolks, it was perfect! 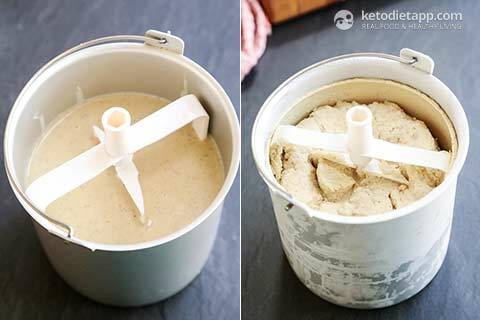 I made mine using this ice-cream maker but it can be made even if you don&apos;t have one. Just follow the steps in my no-churn vanilla ice-cream. If you like eggnog, there are even more recipes you can try! 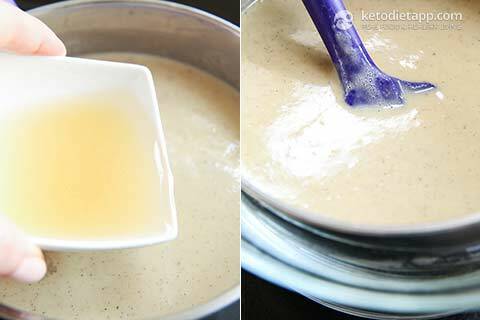 I&apos;ve created Eggnog Mug Cake for my blog, Eggnog Smoothie for the KetoDiet Apps and a classic Eggnog recipe for the KetoDiet Cookbook. 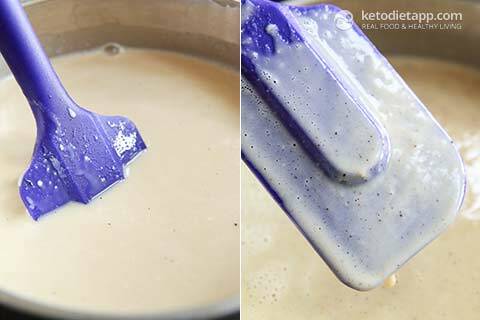 Pour the coconut milk and cream (if used) in a large sauce pan over a medium heat. Reserve 1/2 cup of coconut milk for later. Add the Erythritol and stevia and stir well. 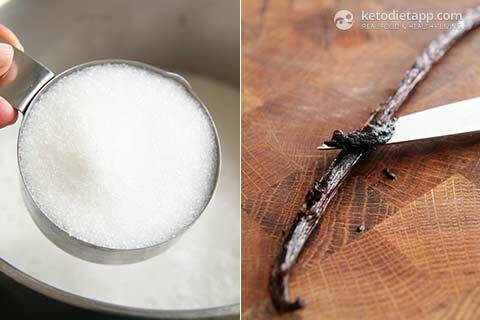 If using vanilla bean, cut the vanilla bean lenghtwise and scrape the seeds out. Add the seeds to the cream. ... nutmeg, salt and stevia (if used). Mix until well combined and cook until foam forms on top. Then, lower the heat. 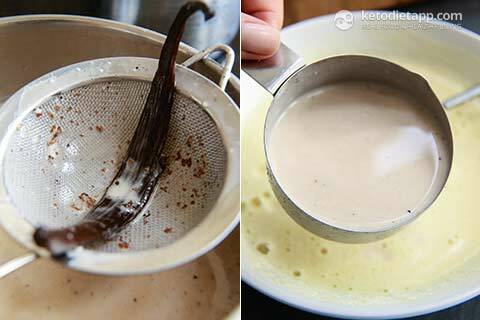 Remove the vanilla bean and discard. 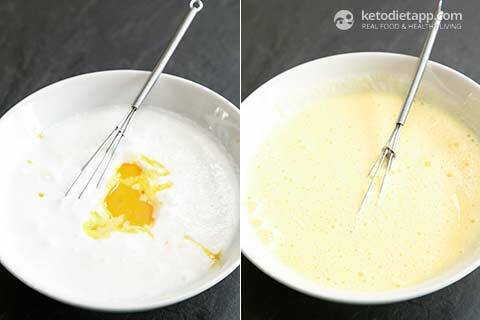 Slowly pour about a cup of the hot mixture into the cold egg yolk mixture while whisking. Then, slowly pour the egg mixture back in the sauce pan and keep mixing. Cook while stirring until the the mixture starts to thicken and the cream mixture lightly covers the spatula. It shouldn&apos;t get as thick as custard - just creamier. Then, take off the heat and set aside. 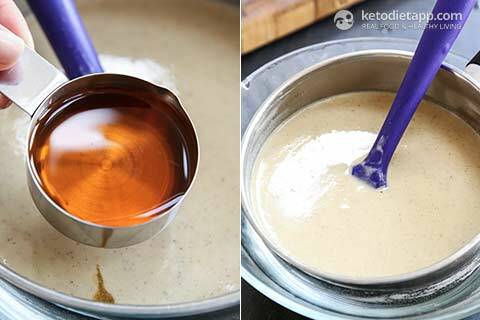 Mix the gelatine with the water and pour it into the cream mixture. Set the sauce pan over an ice bath (a bowl filled with iced water) and let it cool down, stirring occasionally. Add the rum (or rum extract) and mix in well. Let it chill to room temperature. Once it cools down, pour into the ice-cream maker (I use a Cuisinart) and process according to the manufacturer&apos;s instructions. It may take anything between 30-60 minutes depending on your ice-cream maker. When done, scoop in a freezer-friendly container and place in the freezer for 30-60 minutes. I made this for Christmas as our special treat, being in Australia it's not hard to eat ice cream on Christmas. I am not a fan at all, my husband wouldn't eat it either and my kids took one spoonful and spat it out. You don't find the coconut flavour to overpower everything else? Coconut eggnog was horrible and I am the most upset about wasting good rum on a gross recipe. I think that this is down to the coconut milk. I use Aroy-D which is pure coconut with water (no gums and thickeners so no aftertaste). I don't think that the coconut is the issue although you may just not like coconut in which case you should avoid recipes using coconut milk. Heavy whipping cream would be a better way to go. I just made this recipe, experimenting as I am going low carb now and my dad has kidney disease and can not have dairy....trying to find holiday recipes we can have. 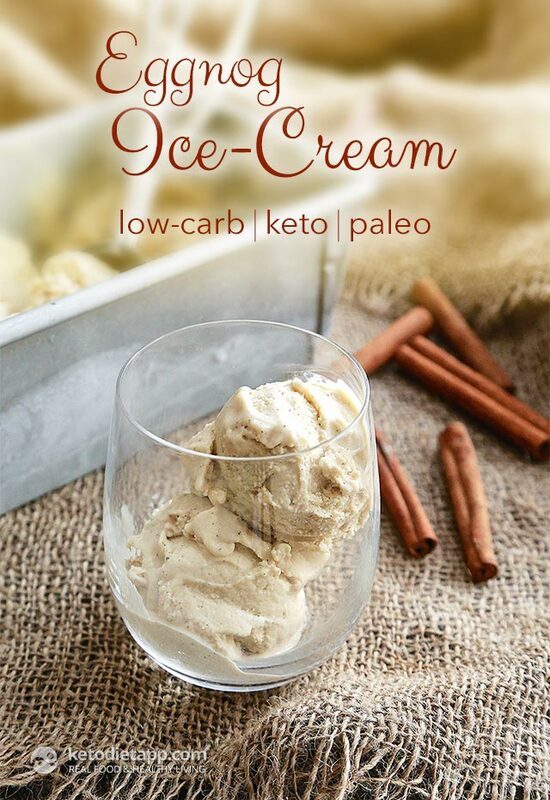 The mixture of this tasted wonderful until I added the rum...it is VERY over powering rum...but the ice cream is nice and soft! I am looking all over for the Vegetable Glycerin, but all I am seeing is something that is used for lotion and body products? I have never heard of MCT....why does it keep the ice cream soft? 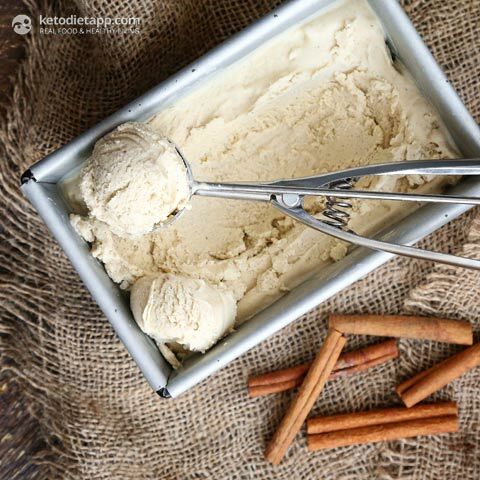 MCT oil helps the ice-cream stay creamy because compared to, for example coconut oil, it doesn't solidify or freeze. Or you could use vodka that has a neutral taste compared to rum. Thank you RoseAnn, I'm glad you liked it! I was just wondering if it is necessary to cook it for good results. Do you think just throwing everything in a blender and then in an icecream maker could work? 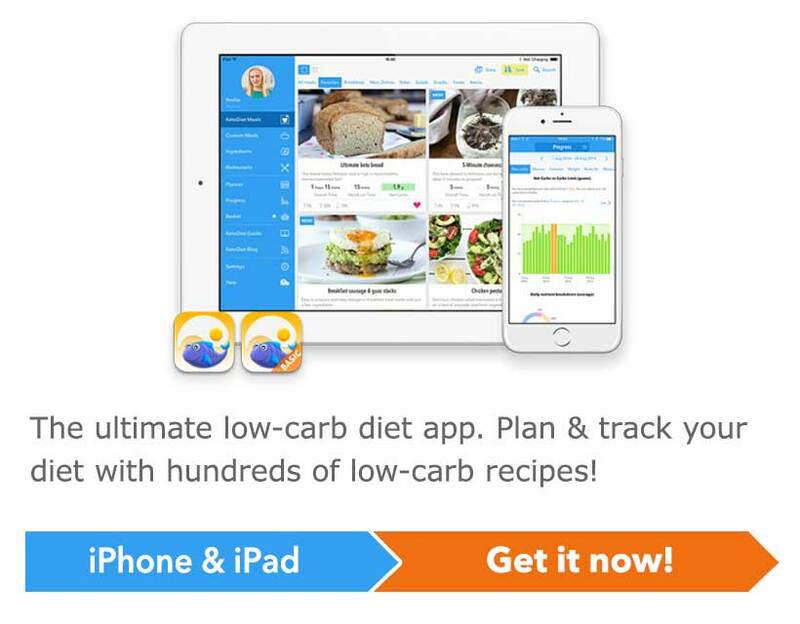 Hi Martina, I just read all the info here on the site, and I just bought the iPad full keto app. I'm so excited. I have been keto almost 2 years and seeing a app like this just really made my life so much better. This seems like it is more versatile for carbs and natural. Thanks again for getting back to me so soon. I just love your blog and all these recipes. Thanks for doing all this to help people. And when you get the food delivery option in America...count me in!!! Thank you so much Rachel, I really appreciate your kind words!!  I hope you enjoy my app and the upcoming updates! I just made the icecream today and it was delicious. 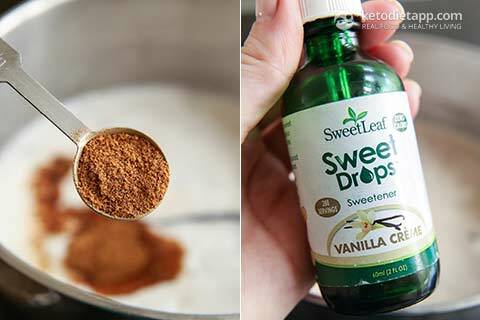 I also was looking for an eggnog recipe for the holidays that cooked the egg such as this recipe- so could I essentially use this for eggnog? That's great, thank you!!! I will try that tomorrow and let you know. And I am going to look at purchasing your cookbook. Do you have it available to download by chance? Yes, it's also on kindle (Amazon)  Thank you! 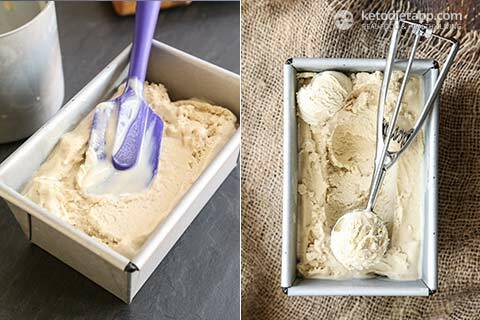 Can this ice cream be made without an ice cream maker? I don't like coconut. Can I substitute almond milk for the coconut milk? I'd use heavy whipping cream instead - if you can tolerate dairy. I haven't tried it with almond milk but II think that it will not make it creamy enough. Or maybe almond milk + more egg yolks and avoid gelatin. My ice cream freezer is in storage. How does this taste as just egg nog? Looks great!